I am so happy to announce the official release of my book, Quiet Kids. This book, in addition to being the book I wish I had read as a child, speaks to introversion in children, pulling on the latest research in the area and providing parents and educators strategies to help support introverted children. As most of you know, my writing career started with my books related to gifted children, and while not all gifted children are introverted, a quiet temperament does dominate that particular subgroup of children. Quiet Kids looks at what it means to be introverted in today's noisy world. Being an introverted child is difficult, especially in an ever-increasingly noisy world. Often viewed as aloof, unmotivated or conceited, introverted children are deeply misunderstood by parents, educators and even their peers. That's where Quiet Kids: Helping Your Introverted Child Succeed in an Extroverted World comes in. Designed to provide parents with a blueprint for not only understanding the nature of introversion, Quiet Kids provides specific strategies to teach their children how to thrive in a world that may not understand them. Presented in an easy-to-read, conversational style, the book uses real-world examples and stories from introverts and parents to show parents and educators how to help children develop resiliency and enhance the positive qualities of being an introvert. With specific strategies to address academic performance, bullying, and resiliency, Quiet Kids is a must read for anyone wishing to enhance the lives of introverted children. Why is important to address temperament, especially introversion, with kids? Helping kids understand their temperament early does a couple of things - first, it helps them understand that they are not crazy. They don't need to force themselves to meet some Western ideal (extroversion), there is strength in introversion. Secondly, it helps parents and educators recognize the unique strengths the introverted child may possess, also serving to remove any stigma introverted children feel. How do you know if your child is introverted? Like any personality trait, each individual introvert is somewhat unique. In general, introversion refers to how a person uses energy - extroverted people tend to thrive on social situations, needing the energy from these situations in order to renew. Introverts, on the other hand, find the energy generated in highly social situations to be draining. They require solitude in order to renew. What are the most challenging things facing parents of introverted children? For the extroverted parent of an introvert, it is recognizing that their child does not NEED to be extroverted in order to be successful - there is strength, significant strength, in being introverted. For the introverted parent, it is making sure not to project any difficulties they had as children onto their own kids. Not all introverted children struggle related to their temperament. 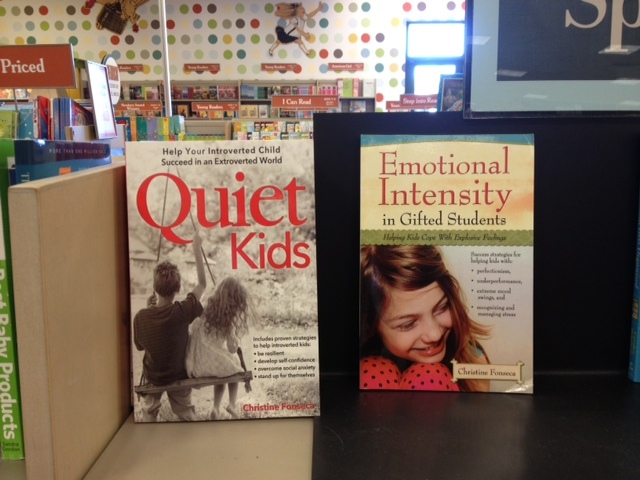 Quiet Kids can be found in Barnes and Noble stores across the United States, as well as online at Amazon, Barnes and Noble, Walmart and other retailers world wide. THANK YOU for the support of this important book. Be sure to check out the events page on my website to see what other fun things I have planned.